BERKELEY CALLING BLOG: “Project Censored Interviews William Pepper, King Family Attorney, on the evidence at the 50th anniversary of the murder of Martin Luther King” 4-06-18 by Vic Sadot. My song highlighting disturbing things that came out in the trial of 1999 that were covered in William Pepper’s second book is featured about 17 minutes into this show. It’s a studio recording released on my “Truth Troubadour” CD at CD Baby in December 2016. My song highlights some of the most disturbing items that came out in the trial, and my video used the photos from that book with permission of William Pepper. The song bears the same title as the book, “An Act of State: The Execution of Martin Luther King”. The recording with Eric Golub on violin from the 2016 “Truth Troubadour” CD was aired on this program from 17:34 to 22:20 on Project Censored – The Plot To Kill King 4-06-18. 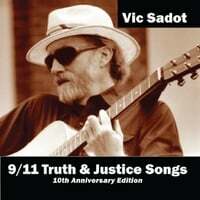 Vic Sadot.